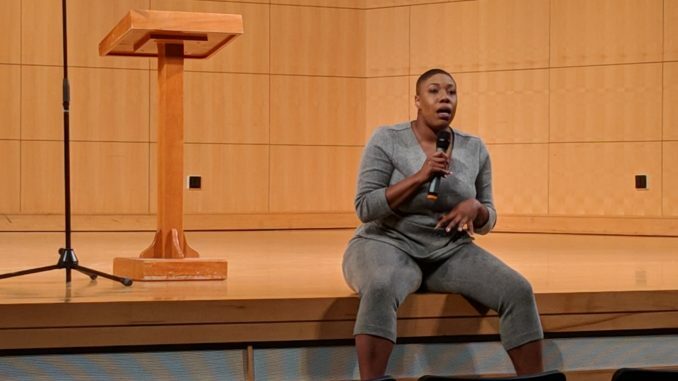 Political activist Symone Sanders came to Truman State University Thursday to talk about creating political change and community building. The Center for Diversity and Inclusion invited Sanders to speak at Truman as part of the University-wide Diversity Week. After the speech, there was a question and answer session and meet and greet. Sanders is a democratic strategist and political commentator on CNN, and previously served as presidential candidate Bernie Sanders’s press secretary in the 2016 election. Sanders said people looking to make political change should adhere to a set of tenets. These tenets include having uncomfortable but constructive conversations with others, being aware of where social advantages lie, being strategic when taking action, not expecting perfect change, and addressing both social adversaries and allies. She talked about historical and social contexts in which action has occurred, and her experiences throughout her life and the 2016 campaign. Additionally, Sanders said she thinks young people should be more politically active and engaging in difficult conversations centered around social change. Additional Diversity Week events include Working Around the World hosted by the Career Center today, a Disabilities Panel March 25, Hip Hop Trivia March 26, Inclusion and Mental Health Discussion March 27, and a movie showing of “Pariah” March 28.